Unreal(R) Tournament 2004 (C) 2004 Epic Games Inc. Unreal and the Unreal logo are registered trademarks of Epic Games Inc. All rights reserved. All other trademarks are the property of their respective owners. 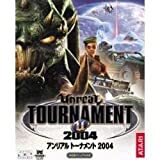 Unreal Tournament 2004 was created by Epic Games Inc., and Digital Extremes. Manufactured and marketed by Atari Japan K.K.